(Bloomberg) -- Debate is swirling around the slumping Swedish krona, with ex-Prime Minister Goran Persson calling on the country to go over to the euro while Riksbank Governor Stefan Ingves took to the nation’s biggest morning paper to hit back at his critics. 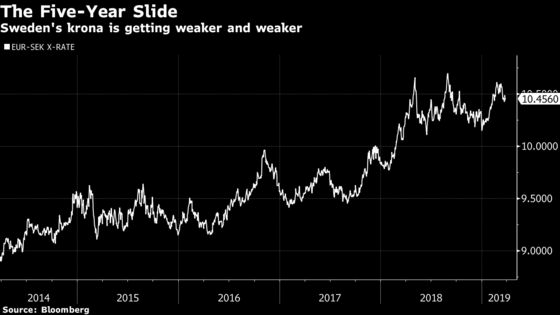 Having weakened successively since 2014, the selloff in the krona has deepened this year and made the krona the world’s worst major currency. A long economic expansion is cooling, which is raising doubts the central bank will be able to lift interest rates above zero. The slump is pressuring large parts of the economy, in particular those businesses that rely on imports. Nordea Bank, the largest Nordic lender, in a note on Wednesday said that the Riksbank has created a “krona-killing monster” with all its stimulus, and revised its outlook for the currency lower this year. The krona slid 0.1 percent to 10.426 per euro as of 9:15 a.m. in Stockholm. Countering the mounting criticism, Riksbank Governor Stefan Ingves said in an op-ed in Dagens Nyheter on Wednesday that there are advantages with having your own currency and that a floating exchange rate can act as a shock-absorber for the domestic economy. According to Persson, who ran Sweden from 1996 to 2006, Sweden only has itself to blame for the current currency turmoil. “This is a good illustration of a vulnerability that’s completely self-inflicted when we decided to stay outside the euro," Persson said in an interview Friday in Orebro, Sweden. Persson, who served as finance minister during Sweden’s economic crisis in the early 1990s, has long advocated that Sweden should adopt the common currency and is still convinced it will join up at some point. A solid majority of Swedes rejected the euro in a referendum in 2003 and support for abandoning the krona remains tepid. As chairman of mining group LKAB, Persson has a front-row seat to the impact of the currency swoon. As a “large export” company “we are making good profit off the weak krona,” he said. “But it’s making it more difficult to address internal problems here at home since there’s a low sense of crisis-awareness," he said. He said neighbors such as Finland (a euro country) and Denmark (krone pegged to the euro) have delivered “decent” economic developments without a floating currency as a cushion. The issue of joining the euro might resurface should foreign investors start circling around Swedish assets that are “on sale" due to the weak krona, Persson said. The “dramatic” slump has a clear connection to the Riksbank’s negative rates, he said. Sweden now could face an economic downturn with little scope for monetary policy stimulus, leaving the burden to fiscal policy. “But fiscal policy is about very small volumes compared to what an interest rate cut can create,” he said.